Everybody loves the glamour of a Penthouse! Being on the top floor is wonderful, particularly when you're in a luxurious Penthouse apartment with superb amenities. Everything that discerning bachelors, career girls, families or couples could wish for has been considered, and benefits include a fabulous 6 person Whirlpool and stunning views over the city and ocean. The owner has furnished this immaculate apartment to the highest standards. Unique features include a sophisticated private roof top social area with stainless steel BBQ, stylish Party Bar, an outdoor table that seats 6, plus a huge designer corner lounge.Come and enjoy a cool drink with friends on the lovely penthouse deck at sunset, or relax in the luxury Whirlpool where you can create just the right ambience with the music system and elegant lighting. This penthouse has 4 fully air-conditioned bedrooms, each furnished with comfort King pillow-top mattresses and 32"flat screen TVs that enable you and your family or friends to browse premium TV channels in comfort. PENTHOUSE 54 is beautifully realized throughout in elegant contemporary style with modern furnishings and fittings, and light, sophisticated colours have been carefully selected to enhance the space. The chic living room is comfortable and inviting, and features such as a large flat screen smart TV for your pleasure and convenience. The custom designed kitchen is fully fitted and equipped with all the mod cons to Western standards, allowing you to create your favourite meals or party snacks. The apartment is close to some of the city's largest shopping malls. It is also conveniently placed for trips to the main avenue "Winston Churchill" with its many cafes, restaurants, banks and entertainment venues. You're also just a 10 minute walk from the well- known Park Mirador Sur in the centre of town, where you can walk, rent bicycles, try a round of mini golf or dine in one of the nice grill restaurants in the vicinity as evening falls. PENTHOUSE 54 is located in "El Cacique", a quiet middle class zone that is just a short distance from the city centre. You can walk from the apartment to the well-known central park of Santo Domingo, Parque Mirador Sur in 10 minutes. You'll find a supermarket and several mini-markets right on the next street corner, and it's only a 10 minute drive to major shopping malls like the Blue Mall, Plaza Central and the Acropolis Centre. Just a few blocks in the opposite direction and you'll come to the main street, Winston Churchill where you'll find many stylish cafes and restaurants, banks and other 'in' places. Santo Domingo has a lot of exquisite Restaurants and the most are in the center of the town (10 minutes by car or taxi). If you feel like having a fast meal today, no problem! Some mayor food chains as Burger King, Pizza Hut, Sandwich stores or Grill Restaurnts are situated very close to PENTHOUSE 54 (3 minutes by car, 10 minutes to walk). Most of them offer a free delivery service. The beautiful PENTHOUSE 54 enjoys a nice location just 800 meters from the ocean drive, the famous "El malecon", guaranteeing you a stunning ocean view and excellent transport connections. The fascinating colonial district of Santo Domingo "Zona Colonial" with its historic buildings and monuments can be reached in 15 minutes, and you will also find that many of the 'in' restaurants and lively bars are located in this fascinating part of the city. If you feel like a relaxing change from the city, go to the beach! The superb beaches of Boca Chica can be reached easily by car in 45 minutes. 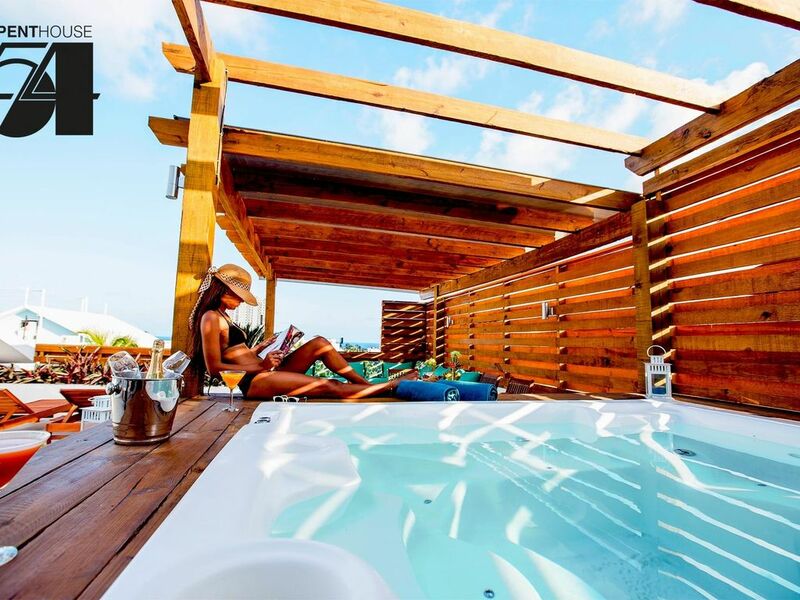 PENTHOUSE 54 offers clients the exclusive and highly sought after tour guide, featuring lots of insider tips on best restaurants, beaches, shopping, outdoor activities, entertainment and nightlife. Your copy of this special guide will be waiting alongside our personal surprise gift, and you'll receive both when you arrive at PENTHOUSE 54. Great place to spend your vacation on. The owner Michael and the manager are awesome. Always puts your needs before there’s. The location is perfectly located in Santo Domingo close by anytime you need. 1 parking space, working jacuzzi, great customer service and WiFi. What more can you ask for? This was the worst vacation experience I have ever had! The pictures on this website do not accurately portray this apartment. There is nothing "luxurious" about this apartment. The furniture looked older and worn, the apartment as a whole was subpar, and the managment person needs to be reprimanded for how he responded to my expressing my concerns. The neighborhood was horrific and unsafe. My friends and I refused to take our luggage out of the van let alone spend the night. We were out of there immediately! I would give it a negative rating if possible. DO NOT STAY HERE! I would NOT recommend this apartment to other travelers. It is definitely not a luxury penthouse. It is equivalent to a 2 star hotel. We didn't have hot water for showers or the jacuzzi our entire stay, the kitchen items were dirty when we arrived (pots/pans, dirty mop next to the refrigerator) the mattresses were extremely uncomfortable with little bedding (no top sheet- just a thin comforter), and the sink in the master bathroom leaked. Not at all as described, and not worth the money. We were very dissatisfied. This house was beautiful and it was exactly what it seems on the photographs. The manager was there when we needed him and he was extremely helpful to us. He helped us navigate the city a lot easier. The neighbors were very nice and friendly, and there are lots of small shops in the neighborhood to buy things that we needed. The only thing is that i wished that there was an air-condition in the living room, however that was not a big issue because the property is very close to the ocean and there was a lot of cool wind blowing. Besides, the AC in the rooms were working perfectly. I will give this property TWO BIG THUMBS UP.